After a strong showing over the weekend, the day began with picket lines gathering across London and in Bristol. Members were set to maintain the strong presence of the previous days. However, it wasn’t all plain sailing. Workers at Endsleigh Gardens had an unpleasant surprise when Howard Sinclair roared up on his motorcycle, dismounted and approached their picket line; presumably to deliver another lecture about the futility of taking strike action. Health and Safety Rep Stewart Hall was ready and quickly asked him why it was that there are HR Business Partner jobs being advertised at 37k when all other front line roles seem to have been downgraded. Howard Sinclair replied that these jobs were being advertised at that rate, as he wanted to pay for “quality.” Members on the picket line couldn’t believe what they heard. This is the man who told us that there is no money in the pot left to pay for decent wages for front line staff. Is this what passes for a charm offensive from Howard Sinclair? What an insult to the workers who are struggling to make ends meet already and who will suffer under his imposed pay cuts. And isn’t this behaviour very close to the intimidation of which he accuses union members? It seems to be one rule for Howard and another for the rest of us. We are clear about the guidance that applies in terms of picketing. The Law allows pickets to explain their case to those entering or leaving the picketed premises, and to ask them not to enter or leave the premises where the dispute is taking place. Pickets should not physically attempt to stop a person or vehicle from entering an office. This may only be done by speaking to people, or it may involve the distribution of leaflets or the carrying of banners or placards putting the Union's case. Our message to members who have been balloted is to support the dispute. 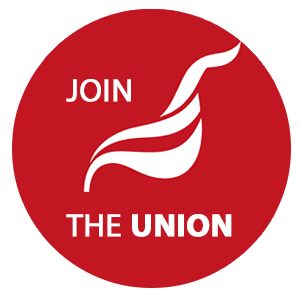 Our message to non-members is to join the Union and join the dispute.